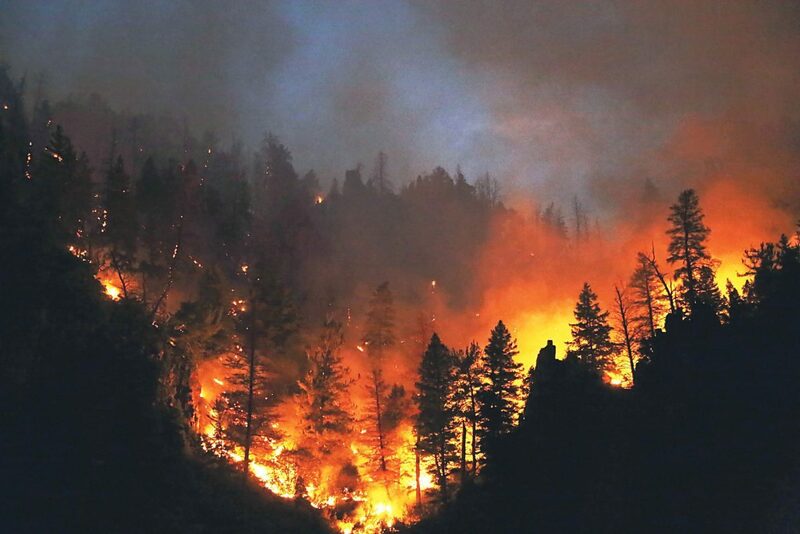 Flames burn through a stand of lodgepole pines in Byers Canyon during the 2015 Byers Canyon Rifle Range Fire. Despite the late April snowfall Middle Park received over the weekend, 2018 is shaping up to be a busy year for wildfires. Colorado has already started burning. Last week, the Badger Hole Fire kicked off in southeastern Colorado near the tiny town of Walsh, with an estimated burn scar covering more than 50,000 acres. Officials in Grand County are planning and preparing for worst-case scenarios as the temperatures rise and local fuel sources begin drying out. Brad White, assistant chief for Grand Fire in Granby, recently reviewed the coming fire outlook as predicated by fire meteorologists with Predictive Services, part of the National Interagency Fire Center. White noted that the predictions for fire behavior are for large-scale fires and do not address small acreage fires, which are more common in Grand County. “Certainly the larger acreage fires trend up with larger numbers of initial starts,” White said. The fire outlook White and other fire officials are currently reviewing provides two predictive models for northern Colorado which forecast average to slightly drier conditions during the summer, coupled with above average temperatures. Locally, White pointed out, 2017 was a wet summer, and Grand County saw a low of growth in grasses and shrubs that have now “cured out” and are “ready for our early summer fires, especially on the west side of the county,” White said. White believes predictions of above-average temperatures for 2018, if proven accurate, could lead to greater fire spread, as opposed to an increase in fire ignitions, which would be related more to below-average moisture conditions. Predictions of a busy 2018 wildfire season come on the heels of a comparatively modest wildfire season for 2017 in Middle Park. Unlike the last few years, Grand County did not experience a significant wildfire outbreak in 2017, though many small fires did occur and were put down quickly by first responders. In 2016, the Gore Range Fire threatened homes west of Kremmling, while the Byers Canyon Rifle Range Fire in 2015 sent crews throughout the county scrambling to put down that blaze.